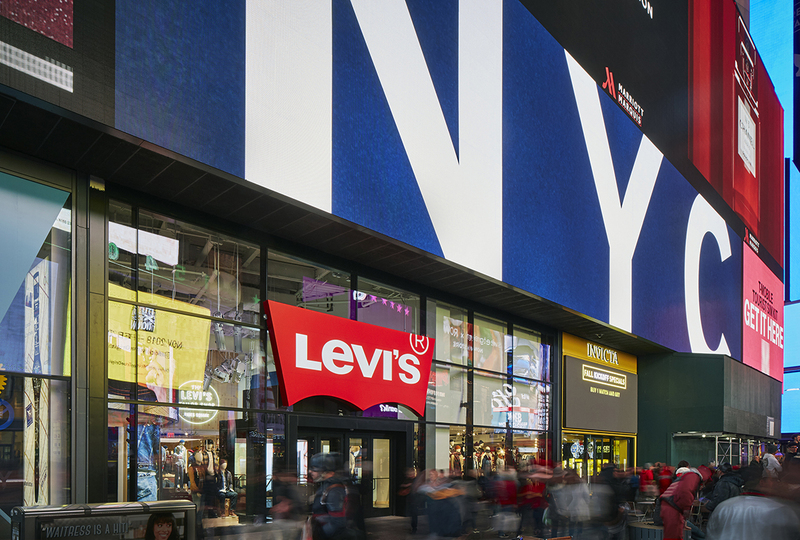 Reflect, BrightSign and D3 teamed to create a striking visual experience at the recently opened Levi’s flagship store in Times Square. At nearly 17,000 square feet, it is the largest Levi’s flagship store in the world. The multi-level location offers the very best in store design, product assortment and omni-channel capabilities, highlighted by the prominent use of AV treatments that create striking visual interest throughout the store. The store has three massive LED panels in key areas – a 41-foot curved panel on the street level near the store entrance, one panel wrapped around the escalator and an 82-foot-wide U-shaped panel wrapped around the grand hall located downstairs. Originally established in 1853, Levi Strauss & Co. is one of the world’s largest apparel companies with 500 stores worldwide, and products available in over 100 countries. When tasked with creating a modern environment that was not only welcoming, but also told the story of the brand, Levi’s turned to Reflect. Reflect – which also oversaw the digital design and integration of the San Francisco Levi’s store – leaned heavily on the use of LED panels to create large-scale vignettes in prominent, hightraffic areas. In total, 10-million LED pixels blanket more than 1,000 square feet of prime wall space located on both levels of the store. The full array of LEDs – supplied by D3 LED – are powered by just two BrightSign XT1144 media players. The inclusion of two additional BrightSign XT1144 media players ensures a high degree of redundancy.